TUMEKE! : John Key isn't laughing at himself, he's laughing at you! John Key isn't laughing at himself, he's laughing at you! Prime Minister John Key has appeared in a video laughing, joking and poking fun at himself during a session with Australian comedian Peter Flaherty. 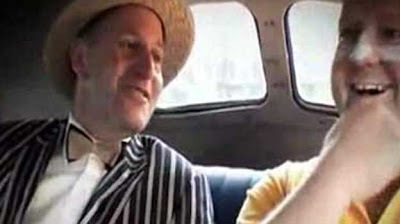 Flaherty's character Shaun Wayne, who bears a remarkable resemblance to cricketer Shane Warne, ambushes Key in a car for the unscripted, seven-minute piece. Key tells Wayne he works for the government – the Aussie has no idea he is talking to the country's leader. The subject of the government's new BMWs become a reason to laugh. "They're nice. They're good value," Key says in the video. "I heard that nice prime minister talking and he didn't have a clue what was going on. He bought 34 of them and he didn't have a clue what was happening. "Honestly, the things they try and whip through, sometimes it's beyond me." ...he's not laughing at himself you Shire Volk, he's laughing at you! He can't believe he gets away with it either. John Key is the piece of aspirational cheese just out of reach of a hungry rat on a mouse wheel, his policies are damaging and will damage the 43% of NZers who earn less than $45 000 in this country while those of his wealth class get more. He's laughing at how the little Shire Volk complain about him buying his luxury BMW's, the way a person with $40 million and an Hawaiian mansion laughs at being threatened with a parking ticket. He decided to purchase luxury vehicles in the same week he called on beneficiaries to get less, and he wasn't honest with his answers when questioned on when he knew about the BMW deal after it was revealed his ministers did in fact send letters to each other and Key had signed them off. He's laughing at you about that. Yet this is the compassionate bloke at the top of the food chain that we want running the country through its worst global economic recession since the 1929 stock market collapse? This is the bloke who says bugger all would starve to death if he cut off all welfare and the bloke who says that if you are poor and needing food parcels that it is your own fault. The total ignorance he exposes when talking about the poor from his on high perch increasingly suggests to me that the political leaders of NZ are totally unaware of how much anger and resentment is bubbling up. The street riots in London have me constantly asking if there will be a riot in Queen St this year as forces collide in Auckland at the height of the World Cup. With Unions looking to politicize action while the World Cup is here, there are plenty of potential flash points looming. It is NOT impossible for Labour to win, National can't get above their 45% high tide party vote to gain the 47% that would gift them majority status, Charles can beat Dunne and Rodney is looking like toast in Epsom. National will need to rely on the Maori Party as a coalition partner, an equation National made last year which is why the expulsion of Hone was always a foregone conclusion. Without coalition partners for National, Labour could win with a majority consisting of NZ First (whom must surely benefit from the Hughes event), the Greens, a decimated Maori Party (whatever is left of it) plus Hone Harawira with a friend. One thing is certain, come November the economic recession will be biting hardest and for the first time in their lives some middle class NZers are not going to feel middle class. That anger and the anger of all those beneficiaries and minimum wage workers will want political representation. If National looks squeezed for partners in the lead up to the election, then I'm thinking they (and their mates at Fairfax & APN) will bang on about how terrible MMP is....in the hope they can win a majority in the future with 40% of the vote. Like they used to. If the Labour Party have to arrange that group of four to make a government, look to Belgium's recent history for an example of what will happen. For me, the Maori Party are gone unless they have enough votes to get National over the line. And National will need them. Labour and the Greens together will have to get 45% of the vote, if they can get NZ First to 5 or 6 seats then that should be enough for very Democratic Socialist government. And honestly probably the best we can hope for given the possibilities available.